The Lincoln 401, is a fully furnished, luxury vacation rental, proudly presented by AdobeStar Properties and located in the brand-new Lincoln Square High Rise of Santa Fe, NM. Relax and indulge as our VIP guests and rest assured, here at The Lincoln, you are as “Downtown Luxury, and Santa Fe Style”, as you can get. The Lincoln 401, provides the quiet and convenience of a fully furnished high rise loft yet it is situated less than one block to the Santa Fe Plaza. Just steps outside the door of your own private residence is where you will visit the 400-year-old historic sites, do some friendly bartering for authentic Native American turquoise under the portal of the Palace of Governors, be inspired by the sheer breadth of art and culture and delight in the finest southwestern cuisine the, “City Different”, has to offer. Discerning clients will enjoy making any of the AdobeStar Properties their optimal choice for luxury rental when visiting Santa Fe. In this historic heart of the City for locals and tourists alike, The Lincoln 401 is your home away from home to recharge and revive the body and soul. The Lincoln 401 is located on the fourth floor of Lincoln Square - capturing the surrounding views of downtown Santa Fe and nearby mountain ranges. Superior craftsmanship went into the design of this wonderfully appointed unit. This unit features a modern take on traditional Santa Fe style. Featuring two bedrooms and two-and-a-half bathrooms, a large open floor plan; stainless steel appointed kitchen, dining room for up to six friends, a spacious and sun drenched living room with a gas-burning kiva fireplace, floor to ceiling/wraparound windows capturing the views to the southern mountains, western mesas and blue sky views to the north. Views are offered from two balconies with patio furniture and soft lighting that will invite you to imbibe the famous New Mexico pinon fire scent, cobalt blue sky and blood red sunsets. The Lincoln 401, sleeps six people in the three bedroom suites, all with king beds and clean, custom-tiled ensuite bathrooms. An additional powder bath is easily accessible from a hallway near the living spaces. The master offers a king bed with high thread count and its own patio. Complete with hand worked wood floors, large closets, a gas fireplace and large French doors to the sunny patio. The master bathroom is complete with spacious walk­-in shower, tiled by the hands of a supremely skilled artisan, stone-topped vanity and custom cabinetry. At the opposite end of the casita, the two king-bedded guest suites each feature a lovely bathroom with more custom tilework and cabinetry, a walk­-in shower with European glass shower door, and spacious walk-in closet. These lovely suites also feature diamond plaster walls, wood floors, luxurious linens and their own TVs. The central common spaces of this fine residence flow into one another, without unnecessary dividing walls. The gorgeous kitchen is fresh and bright, with custom cabinets and smooth granite accentuating the stainless steel appliances. The living room is large and comfortably furnished, with a fireplace and a massive beam providing definition to this perfect space. For dining with your group, a long table seats eight with ease, more if needed. The patios are accessible from the living and dining areas. Other amenities include a fully equipped laundry room, custom soaps and bath supplies, satellite television, free wi­fi, soft Frette linens, comfy bathrobes and plentiful pillows; off-street parking for one car is included as well. Experience a totally new concept in approximately 2,447 square feet of “Downtown Luxury, Santa Fe Style”. 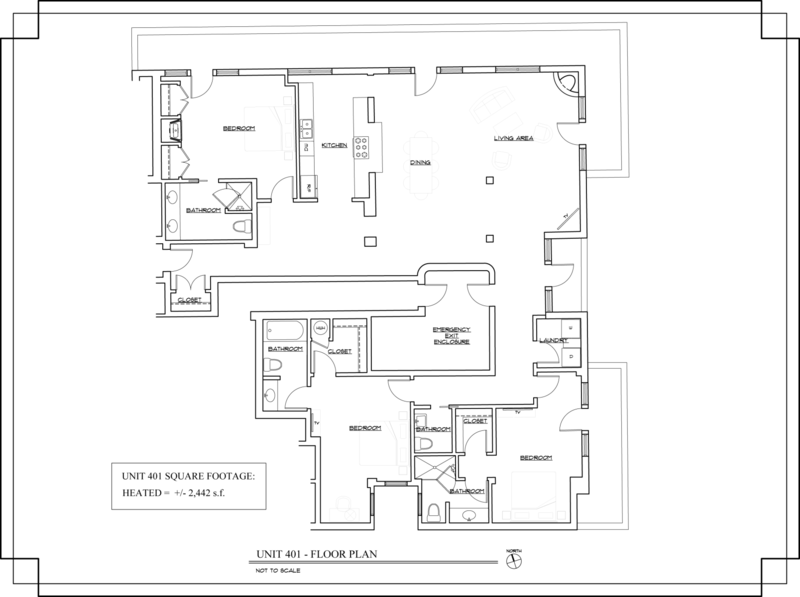 Three full bathrooms, one with a tub/shower, one powder bath. Glass doors, custom tile, fixtures and cabinets. Outdoor wraparound deck / patio with views of the west and east mountains and Downtown Santa Fe.